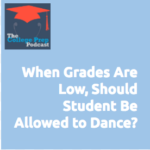 131: When Grades Are Low, Should Student Be Allowed to Continue Extracurricular Activities? Should parents take away student’s activities if their academic grades are not up to snuff? Megan and Gretchen weigh in on this important question from a listener, about how to work with her middle school age daughter who loves to participate in a dance troupe, and who has made great strides in her difficulties with math but still continues to struggle. My husband and I are at odds about how to encourage our daughter to keep up the good work. She’s a dancer and we told her last year that she could not audition for the dance company unless her math grade was a B and she had turned in all her work. I was fine with that, but now since seeing her most recent test scores, he wants to make her continued participation contingent on her math grade. I do not like that solution because it punishes not only her, but the other dancers. I think she’s struggling with math and can use this year to figure out how to balance her life in the low risk environment of middle school. I also don’t want to set her up for such an epic punishment if she brings home a C or even a D.
Tune in to hear what Megan and Gretchen suggest!